Last year, East London welcomed the widest and the biggest vessels in this city’s history and in 2019, the record-breaking momentum continued with the successful docking of the longest vessel at the Port of East London today. The Zen Hua 20, is equivalent to two and a half rugby fields in length at 247,2 metres with a beam of 41,2 metres. At 39 923 gross tonnes, the vessel required the assistance of three TNPA tugs, namely, Impunzi, Mthwalume and Mvezo as well as pilot boat – Tristan Tern to ensure a successful docking. 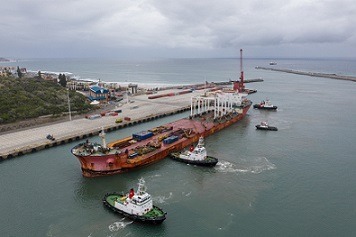 Transnet National Ports Authority, Port of East London Port Manager, Sharon Sijako said safely docking the massive vessel required in-depth preparation. This included a site visit by Port of East London Pilot, Billy Rowe, who travelled to the Port of Ngqura to observe the vessel’s manoeuvring characteristics in preparation for its arrival at the Port of East London. “Welcoming a vessel of this size requires meticulous planning and flawless execution. Our marine crew worked efficiently in planning and arranging the optimal conditions to ensure that the vessel entered and docked safely and incident-free,” said Sijako. Rowe, who docked the vessel said that although the task was extremely daunting and challenging, he was proud to have contributed to this momentous occasion. “It is exciting to play a part in the making of port history. I am grateful for the support of the various crew members, who assisted me in docking the vessel safely,” he said. In April 2018, the Port of East London handled its widest vessel to ever dock in the city when the Chinese-owned Zhen Hua 8, a 220 metre multi-purpose heavy load carrier with a beam of 42,3 metres, docked safely and without incident. The following month, new generation Post Panamax Ro-Ro vessel MV THERMOPYLAE, the widest car carrier and the first HERO Class vessel, called at the port on its maiden voyage. With a width of 36.5 metres, gross tonnage of 75283 tons and a length of just under 200 metres, the car carrier is substantially broader than the standard large ships, which are slightly over 32 metres wide. Previous car carriers that have docked in East London have had a maximum beam of 32 metres. The vessel, Zen Hua 20, has been docking at the other South African ports to collect and relocate various cargo equipment and mobile cranes on behalf of Transnet Port Terminals (TPT). Executive Manager Containers & Auto Cape at TPT, Wandisa Vazi said: “In efforts to continually improve business efficiency and operations, TPT has undertaken the relocation of equipment across TPT terminals this quarter. The relocation effort is a collaboration between the various TPT Terminals and will see each terminal benefiting from this initiative by improving on operation efficiencies” This strategic move will also assist TPT Terminals in achieving the set business targets, Vazi added.